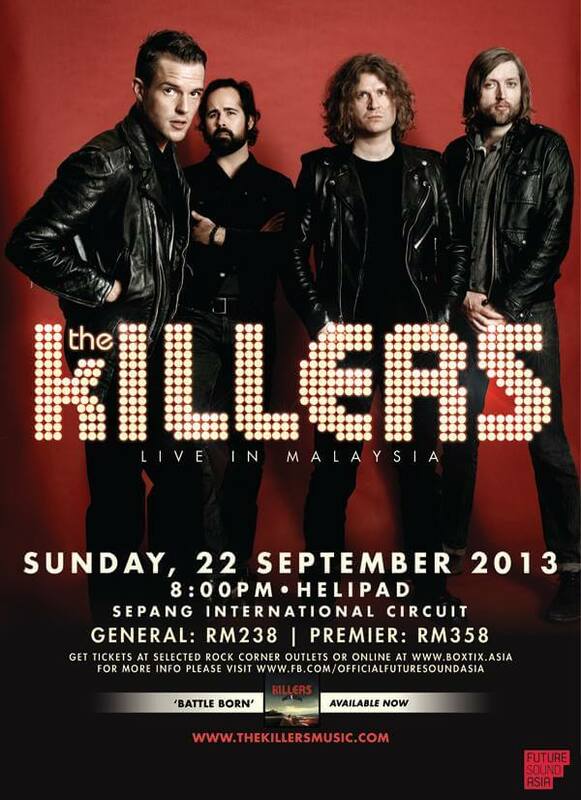 The Killers will perform for one night only at the Sepang International Circuit (SIC) on Sunday, 22 Sept 2013. Tickets will be available at all six Rock Corner outlets and www.boxtix.asia from July 29 onwards. Doors open at 8 pm. The Killers current line-up Brandon Flowers, Dave Keuning, Mark Stoermer and Ronnie Vannucci Jr will take the stage at #TheKillersMY with this decade’s indie anthems, “Mr. Brightside”, “When We Were Young”, “Somebody Told Me”, “All The Things That I Have Done” and more. Named after a fictional band in a New Order video, The Killers hail from Las Vegas, Nevada. Their debut, Hot Fuss, catapulted them onto the global stage upon its 2004 release. Since then the band has released four albums that collectively sold over 20 million copies worldwide. The band has also received seven Grammy nods and won a variety of MTV, BRIT, and NME awards. The band toured for two years straight after Hot Fuss, playing over four hundred shows. They’ve also headlined some of UK and Europe’s largest festivals, including Glastonbury, the Reading and Leeds Festival and Pukkelpop, and also sold out in prestigious venues such as Madison Square Garden in America.